I’m pleased to introduce the newest member of the Lisette family: Little Lisette. 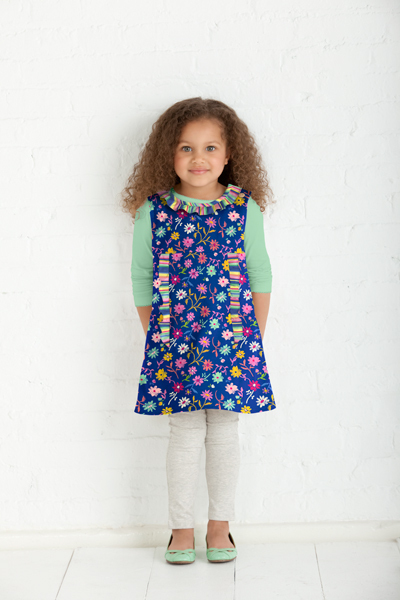 Little Lisette is a collection of sewing patterns and apparel fabrics created especially for girls aged 3-14. The line debuts this month with two patterns from Simplicity and a fall fabric collection which is available at Jo-Ann stores across the United States. The fabrics are designed to be both functional and fun. This first Little Lisette collection features bold prints in bright colors done in a variety of apparel fabrications, including corduroy, poplin, sateen, and twill. You can preview the collection in the Fabric section of our website. The fabrics are making their way onto shelves at Jo-Ann stores this week, just in time for your back-to-school sewing. You’ll find them on the same shelf with the Lisette fabrics at your local Jo-Ann. The first Little Lisette pattern release, which is now available at Jo-Ann stores and on our website, features two styles: a dress for girls size 3-8 and a skirt and top outfit for girls sizes 3-14. The Little Lisette patterns feature the ruffles and frills that little girls love. They are simple styles, and they are designed to be quick and easy to sew. They are also being made available at a very affordable price. Little Lisette style 2063 is a dress featuring a button closure at the shoulder and ruffle details at the neck and seams. The dress can also be made with flat piping at the seams or with tiered ruffles for lighter-weight fabrics that give the dress a sweet look and which lets you play with a few different prints. Little Lisette style 2064 features a tuxedo-style ruffled blouse with flared or gathered long sleeves. The included skirt can be made with an A-line silhouette or a bubble effect and includes bias-trimmed pockets for both views. I hope you’ll enjoy sewing with these new patterns and fabric. I would love to see what you make. So please post your photos to the Lisette Flickr group! Okay, I love these. I don’t have kids but that doesn’t stop me from buying Oliver + S, so I’ll just need to grab these the next time I’m at JoAnn’s! Thanks so much!! I feel like I learn more and more about sewing every time I use a Lisette or O+S pattern. Oh, what fun! Lovely lovely! These designs look absolutely lovely. So sad you have’t done any boy ones though – such a shame for all of us who don’t have little girls to sew for! I just found one of these patterns for sale, and its the exact dress pattern (2063), except it says 0409 on it. Anyone know whats going on there? Alexandra, when Simplicity does a special box out promotion for their top retailers (these are patterns that sit in a special rack on top of the cabinets), they give the styles different numbers so they can track those sales separately. Rest assured that the pattern inside is the same one.